Bits of My Own: Happy St. Pats Everybody! and what better day to show this finish? 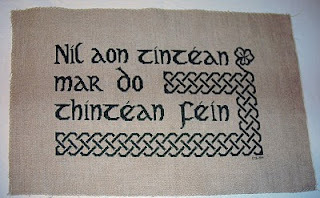 Nil aon tintean mar do thintean fein translates to "No hearth like your own hearth", or "Home Sweet Home". Stitched from a freebie found at http://www.gryphonsmoon.com/. 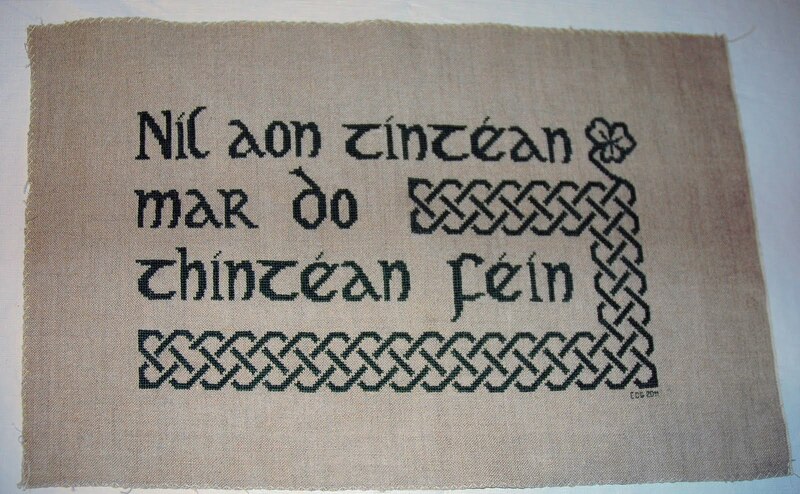 I stitched it on 32ct Natural Irish linen with 4 skeins of DMC 935 (dark green). Hope to find a frame for it soon. 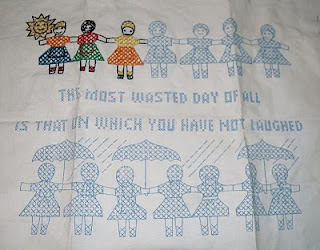 What I wanted to stitch next was Ann Grant because I love all the pinks in it! I just couldn't justify spending the $25 though when I have quite a few projects waiting for me in my stash. 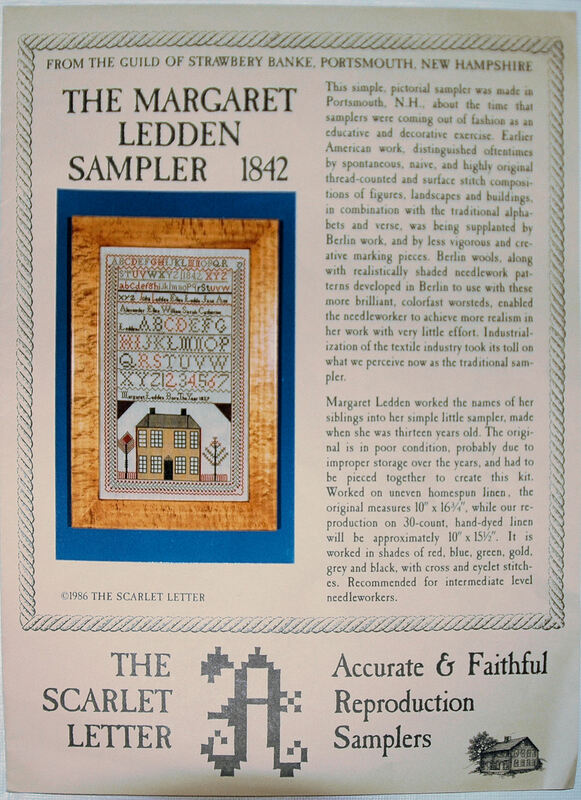 So, I picked The Margaret Ledden Sampler. This is one that I have had for ages! From The Scarlet Letter in 1986, I don't even think it is still in print. 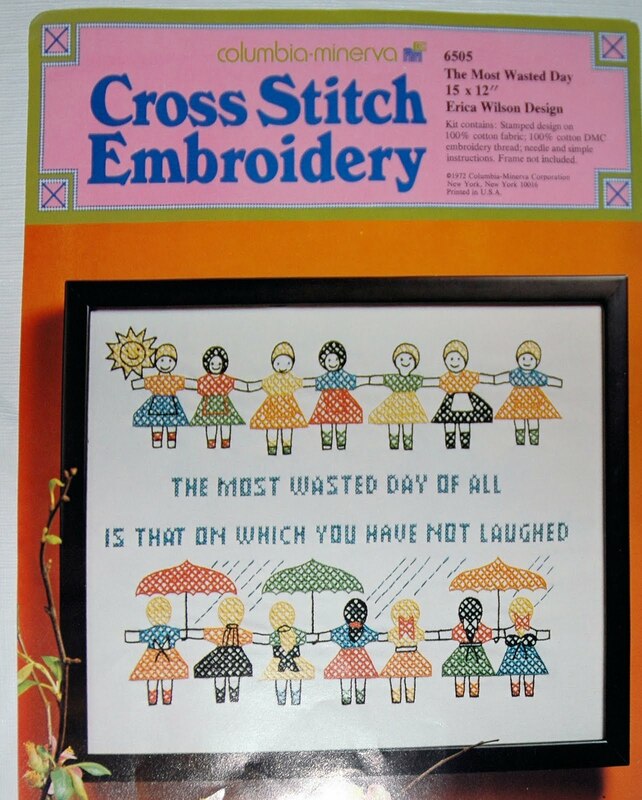 Do you ever have times when you are just too tired or wiped out to stitch, but still want to work on something? 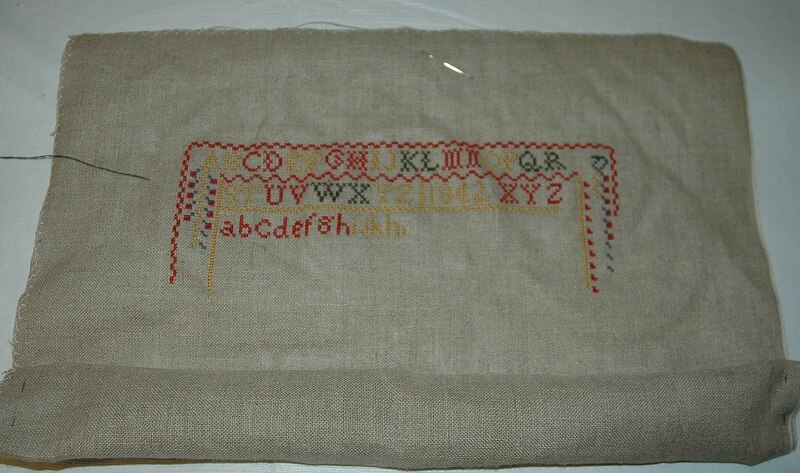 When I am just too brain dead to work on anything complicated, I pull out one of my easy peasy little ones. I picked this one up at an estate sale. Now, I do not have any children, so this might seem like a strange choice, but there is something very endearing about these old pieces. I think many of them deserve a second look. 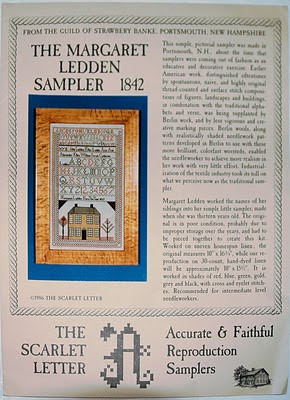 I have also found that they look very nice framed with a colorful mat, something I don't usually do with the traditional samplers. It is very, very weird stitching with 6 strands of floss! Happy St. Patrick's Day! Love the Irish blessing piece! And your new SL start is really pretty! Cute piece for when you're tired too. Fantastic finish! Perfect for a St. Patrick's Day finish. I love your new start. What a great finish!! 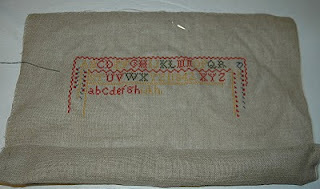 And wonderful progress on the sampler....6 strands?! That WOULD be wierd! The new sampler start looks wonderful and the colors are so pretty. I haven't done any stamped embroidery in ages, but it can be relaxing. Enjoy! Just have to tell you that I really like the vintage stamped piece. 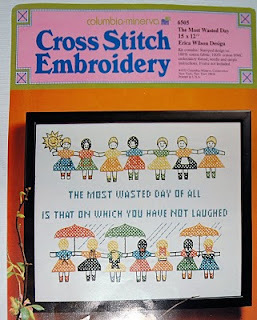 I've been on a bit of a vintage kick myself; I sure wish I had my first stamped sampler. Be sure to show us the finish when you complete! I think this one is adorable.